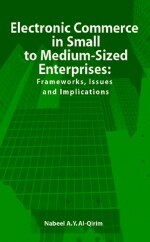 This chapter adopts a ‘technology cluster’ perspective in examining Internet usage within SMEs, analyzing Internet usage in terms of three distinct Internet technology groupings. Specific attention is paid to identifying and categorizing the diffusion pattern of website development among the SME sector on the basis of the theory of mimetic IT adoption patterns. Two potential hybrid diffusion patterns are identified, and their implications for policy makers and development agencies in the SME sector are discussed.